A certification authority (CA) is responsible for attesting to the identity of users, computers, and organizations. The CA authenticates an entity and vouches for that identity by issuing a digitally signed certificate. The CA can also manage, revoke, and renew certificates. 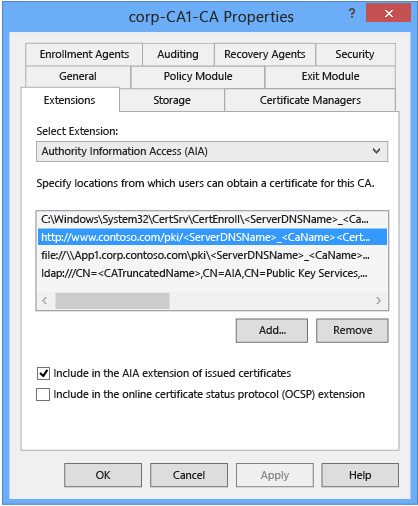 By installing the Certification Authority role service of Active Directory Certificate Services (AD CS), you can configure your Windows server to act as a CA. Plan a public key infrastructure (PKI) that is appropriate for your organization. Install and configure a Hardware Security Module (HSM) according to the HSM vendor instructions, if you are planning to use one. Create an appropriate CAPolicy.inf, if you want to modify the default installation settings. To ensure that your organization can take full advantage of your Active Directory Certificate Services (AD CS) installation, you must plan the PKI deployment appropriately. You should determine how many CAs you will install and in what configuration before you install any CA. Creating an appropriate PKI design can be time consuming, but it is important for the success of your PKI. For more information and resources, see PKI Design Guidance in Microsoft TechNet. Using a hardware security module (HSM) can enhance the security of the CA and the PKI. An HSM is a dedicated hardware device that is managed separately from the operating system. These modules provide a secure hardware store for CA keys, in addition to a dedicated cryptographic processor to accelerate signing and encrypting operations. The operating system utilizes the HSM through the CryptoAPI interfaces, and the HSM functions as a cryptographic service provider (CSP) device. HSMs typically are PCI adapters, but they are also available as network-based appliances, serial devices, and USB devices. If an organization plans to implement two or more CAs, you can install a single network-based HSM and share it among multiple CAs. To set up a CA by using an HSM, the HSM must be installed and configured before you set up any CAs with keys that will be stored on the HSM. The CAPolicy.inf file is not required to install AD CS, but it can be used to customize the settings of the CA. The CAPolicy.inf file contains various settings that are used when installing a CA or when renewing the CA certificate. The CAPolicy.inf file must be created and stored in the %systemroot% directory (typically C:\Windows) for it to be used. The OIDs shown in the example CAPolicy.inf are examples only. Individual organizations should obtain their own OIDs. For more information about OIDs, see Obtaining a Root OID from an ISO Name Registration Authority. For more information, see CAPolicy.inf Syntax. The following sections describe the configuration options that you will select after installing the CA binary installation files. Enterprise CAs are integrated with Active Directory Domain Services (AD DS). They publish certificates and certificate revocation lists (CRLs) to AD DS. Enterprise CAs use information that is stored in AD DS, including user accounts and security groups, to approve or deny certificate requests. Enterprise CAs use certificate templates. When a certificate is issued, the Enterprise CA uses information in the certificate template to generate a certificate with the appropriate attributes for that certificate type. If you want to enable automated certificate approval and automatic user certificate enrollment, use Enterprise CAs to issue certificates. These features are available only when the CA infrastructure is integrated with Active Directory. Additionally, only Enterprise CAs can issue certificates that enable smart card sign-in, because this process requires that smart card certificates are mapped automatically to the user accounts in Active Directory. By default, you must be a member of the Enterprise Admins group to install and configure an Enterprise CA. If you want a low-privileged domain administrator to install and configure an Enterprise CA, see Delegated Installation for an Enterprise Certification Authority. Stand-alone CAs do not require AD DS, and they do not use certificate templates. If you use stand-alone CAs, all information about the requested certificate type must be included in the certificate request. By default, all certificate requests that are submitted to stand-alone CAs are held in a pending queue until a CA administrator approves them. You can configure stand-alone CAs to issue certificates automatically upon request, but this is less secure, and it is usually not recommended because the requests are not authenticated. You must use stand-alone CAs to issue certificates when you are using a non-Microsoft directory service or when AD DS is not available. You can use both enterprise and stand-alone certification authorities in your organization, as explained in the following table. A root CA is the CA that is at the top of a certification hierarchy. It must be trusted unconditionally by clients in your organization. All certificate chains terminate at a root CA. Whether you use enterprise or stand-alone CAs, you need to designate a root CA. Since the root CA is the top CA in the certification hierarchy, the Subject field of the certificate that is issued by a root CA has the same value as the Issuer field of the certificate. Likewise, because the certificate chain terminates when it reaches a self-signed CA, all self-signed CAs are root CAs. The decision to designate a CA as a trusted root CA can be made at the enterprise level or locally by the individual IT administrator. A root CA serves as the foundation upon which you base your certification authority trust model. It guarantees that the subject's public key corresponds to the identity information shown in the subject field of the certificates it issues. Different CAs might also verify this relationship by using different standards; therefore, it is important to understand the policies and procedures of the root certification authority before choosing to trust that authority to verify public keys. The root CA is the most important CA in your hierarchy. If your root CA is compromised, all CAs in the hierarchy and all certificates issued from it are considered compromised. You can maximize the security of the root CA by keeping it disconnected from the network and by using subordinate CAs to issue certificates to other subordinate CAs or to end users. CAs that are not root CAs are considered subordinate. The first subordinate CA in a hierarchy obtains its CA certificate from the root CA. This first subordinate CA can use this key to issue certificates that verify the integrity of another subordinate CA. These higher subordinate CAs are referred to as intermediate CAs. An intermediate CA is subordinate to a root CA, but it serves as a higher certifying authority to one or more subordinate CAs. An intermediate CA is often referred to as a policy CA because it is typically used to separate classes of certificates that can be distinguished by policies. For example, policy separation includes the level of assurance that a CA provides or the geographical location of the CA to distinguish different end-entity populations. A policy CA can be online or offline. It is not possible to convert a root CA to a subordinate CA, or vice versa. The private key is part of the CA identity, and it must be protected from compromise. Many organizations protect CA private keys by using a hardware security module (HSM). If an HSM is not used, the private key is stored on the CA computer. For more information, see Hardware Security Module (HSM) in Microsoft TechNet. Offline CAs should be stored in secure locations and not connected to the network. Issuing CAs use their private keys when issuing certificates, so the private key must be accessible (online) while the CA is in operation. In all cases, the CA and its private key on the CA should be physically protected. If you already have an existing private key that you want to use during installation, you can use the Existing Key screen to locate that key. You can use the Change button to modify the cryptographic provider, and optionally, the CA that you want to search for an existing key. If you already have a certificate that contains the private key for the CA, you can use the Existing Certificate screen to locate it. You can use the Import button to open the Import Existing Certificate dialog box, and then locate your existing PKCS #12 file. Selecting cryptographic options for a certification authority (CA) can have significant security, performance, and compatibility implications for that CA. Although the default cryptographic options may be suitable for most CAs, the ability to implement custom options can be useful to administrators and application developers with a more advanced understanding of cryptography and a need for this flexibility. Cryptographic options can be implemented by using cryptographic service providers (CSPs) or key storage providers (KSPs). When using an RSA certificate for a CA, ensure that the key length is at least 2048 bits. You must not attempt to use an RSA certificate below 1024 bits for the CA. The CA service (certsvc) will not start if an RSA key of less than 1024 bits is installed. CSPs are hardware and software components in Windows operating systems that provide generic cryptographic functions. CSPs can be written to provide a variety of encryption and signature algorithms. KSPs can provide strong key protection for computers running a minimum server version Windows Server 2008 R2 and a minimum client version of Windows Vista. When you select the provider, hash algorithm, and key length, carefully consider what cryptographic options the applications and devices that you intend to use can support. Although it’s a best practice to select the strongest security options, not all applications and devices can support these. If your support requirements change and you are then able to use the stronger security options, such as migrating to a KSP and a stronger hash algorithm, see Migrating a Certification Authority Key from a Cryptographic Service Provider (CSP) to a Key Storage Provider (KSP). Allow administrator interaction when the private key is accessed by the CA is an option that is typically used with hardware security modules (HSMs). This allows the cryptographic provider to prompt the user for additional authentication when the private key of the CA is accessed. This option can be used to help prevent unapproved use of the CA and its private key by requiring the administrator to enter a password before every cryptographic operation. The built-in cryptographic providers support specific key lengths and hash algorithms as described in the following table. You can create a name by using any Unicode character, but you might want to use the ANSI character set if interoperability is a concern. For example, certain types of routers will not be able to use the Network Device Enrollment Service to enroll for certificates if the CA name contains special characters such as an underscore. The CA name should not be identical to the name of the computer (NetBIOS or DNS name). Also, you cannot change the name of a server after Active Directory Certificate Services (AD CS) is installed without invalidating all the certificates that are issued by the CA. For additional considerations regarding CA names, see TechNet Wiki article: Considerations for Certification Authority (CA) Names. To change the server name after AD CS is installed, you must uninstall the CA, change the name of the server, reinstall the CA using the same keys and modify the registry to use the existing CA keys and database. You do not have to reinstall a CA if you rename a domain; however, you will have to reconfigure the CA to support the name change. After a root certification authority (CA) has been installed, many organizations will install one or more subordinate CAs to implement policy restrictions on the public key infrastructure (PKI) and to issue certificates to end clients. Using at least one subordinate CA can help protect the root CA from unnecessary exposure. When you install a subordinate CA, you must obtain a certificate from the parent CA. If the parent CA is online, you can use the Send a certificate request to a parent CA option, and select the parent CA by CA name or computer name. If the parent CA is offline, you should use the Save a certificate request to file on the target machine option. The procedure for this will be unique to the parent CA. At a minimum, the parent CA should provide a file that contains the subordinate CA's newly issued certificate, preferably its full certification path. Install the parent CA's certificate in the Intermediate Certification Authorities certificate store of the computer if the parent CA is not a root CA. Install the certificates of any other intermediate CA in the chain. Install the certificate of the root CA into the Trusted Root Certification Authorities store. These certificates should be installed in the certificate store before you install the CA certificate on the subordinate CA you have just set up. Certificate-based cryptography uses public-key cryptography to protect and sign data. Over time, attackers could obtain data that was protected with the public key and attempt to derive the private key from it. Given enough time and resources, this private key could be compromised, effectively rendering all protected data unprotected. Also the names that are guaranteed by a certificate may need to be changed over time. Because a certificate is a binding between a name and a public key, when either of these change, the certificate should be renewed. Every certificate has a validity period. After the end of the validity period, the certificate is no longer considered an acceptable or usable credential. CAs cannot issue certificates that are valid beyond their own validity period. A best practice is to renew the CA certificate when half of its validity period is expired. When installing a CA, you should plan this date and ensure that it is recorded as a future task. As in many databases, the certification authority's database is a file on the hard drive. In addition to this file, other files serve as the transaction logs, and they receive all modifications to the database before the changes are made. Because these files may be accessed frequently and simultaneously, it is best to keep the database and transaction logs on separate hard drives or high-performance disk configurations, such as striped volumes. You can move the certificate database and log files after installation. For information, see article 283193in the Microsoft Knowledge Base. After a root or subordinate CA is installed, you must configure the Authority Information Access (AIA) and CRL distribution point (CDP) extensions before the CA issues any certificates. The AIA extension specifies where to find up-to-date certificates for the CA. The CDP extension specifies where to find up-to-date CRLs that are signed by the CA. These extensions apply to all certificates that are issued by that CA. Configuring these extensions ensures that this information is included in each certificate that the CA issues so that it is available to all clients. This ensures that PKI clients experience the least possible number of failures due to unverified certificate chains or certificate revocations, which can result in unsuccessful VPN connections, failed smart card sign-ins, or unverified email signatures. As a CA administrator, you can add, remove, or modify CRL distribution points and the locations for CDP and AIA certificate issuance. Modifying the URL for a CRL distribution point only affects newly issued certificates. Previously issued certificates will continue to reference the original location, which is why you should establish these locations before your CA distributes any certificates. Avoid publishing delta CRLs on offline root CAs. Because you do not revoke many certificates on an offline root CA, a delta CRL is probably not needed. Adjust the default LDAP:/// and HTTP:// URL locations on the Extensions tab of the certification authority’s Properties Extension tab according to your needs. Publish a CRL on an HTTP Internet or extranet location so that users and applications outside the organization can perform certificate validation. You can publish the LDAP and HTTP URLs for CDP locations to enable clients to retrieve CRL data with HTTP and LDAP. Remember that Windows clients always retrieve the list of URLs in sequential order until a valid CRL is retrieved. Use HTTP CDP locations to provide accessible CRL locations for clients running non-Windows operating systems. For more information about CRLs and delta CRLs, see Configuring Certificate Revocation. Windows PowerShell and certutil support variable numbers (preceded by a percent (%) sign) to help in publishing CDP and AIA locations. The CA’s Properties Extension tab supports bracketed variables. The following table equates the variables between the interfaces and describes their meanings. %1 <ServerDNSName> The DNS name for the CA computer. If connected to a DNS domain, it is the fully qualified domain name; otherwise, it is the hostname of the computer. %4 <CertificateName> This allows each additional revision of the certificate to have a unique suffix. %8 <CRLNameSuffix> This inserts a suffix on the file name when publishing a CRL to a file or URL location. %9 <DeltaCRLAllowed> When a delta CRL is published, this replaces the CRLNameSuffix variable with a separate suffix to distinguish the delta CRL from the CRL. %10 <CDPObjectClass> The object class identifier for CRL distribution points, which is used when publishing to an LDAP URL. %11 <CAObjectClass> The object class identifier for a CA, which is used when publishing to an LDAP URL. The AIA extension tells the client computers where they can find the certificate to be verified. This allows the client to confirm whether the certificate can be trusted. You can configure the AIA extension by using the Certification Authority interface, Windows PowerShell, or the certutil command. The following table describes the options that you can use with the AIA extension by using these methods. The domain name is corp.contoso.com. There is a web server named App1 in the domain. App1 has a shared folder named PKI that allows the CA Read and Write permissions. App1 has a DNS CNAME of www and a shared virtual directory named PKI. The first protocol that client computers should use for the AIA information is HTTP. The second protocol that client computers should use for the AIA information is LDAP. The CA that is being configured is an online issuing CA. OCSP is not in use. The interface uses the variables and check box names that are described in the previous tables. You can access the interface through the Certification Authority interface. From the contents pane, right-click the CA, click Properties, and then click Extensions. In Select extension, click Authority Information Access (AIA). Add-CAAuthorityInformationAccess -AddToCertificateAia "ldap:///CN=%7,CN=AIA,CN=Public Key Services,CN=Services,%6%11"
If you use Windows PowerShell to add AIA paths, existing paths remain in place. The first Windows PowerShell command in the example removes all the existing paths. For more information about removing AIA paths by using Windows PowerShell, see Remove-CAAuthorityInformationAccess. You cannot add a local path by using the Add-CAAuthorityInformationAccess Windows PowerShell cmdlet. The CA certificate will automatically be published to the default location of %systemroot%\system32\CertSrv\CertEnroll. certutil -setreg CA\CACertPublicationURLs "1:C:\Windows\system32\CertSrv\CertEnroll\%1_%3%4.crt\n2:http://www.contoso.com/pki/%1_%3%4.crt\n1:file://\\App1.corp.contoso.com\pki\%1_%3%4.crt\n2:ldap:///CN=%7,CN=AIA,CN=Public Key Services,CN=Services,%6%11"
In a certutil command, type all paths as one continuous string enclosed in quotes. Each path is separated by a \n. The CDP extension tells client computers where they can find the most recent CRL, so the client can confirm that a particular certificate has not been revoked. 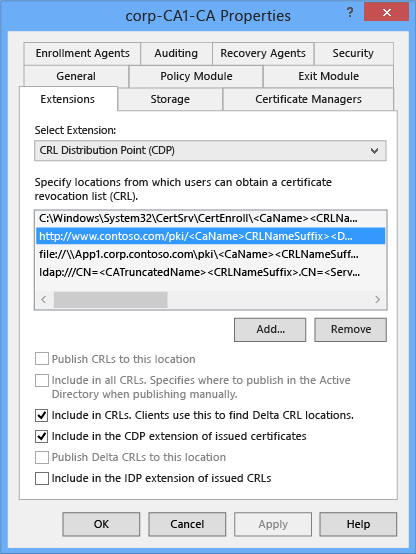 You can configure the CDP extension by using the Certification Authority interface, Windows PowerShell, or the certutil command. The following table describes the options that you can use with the CDP extension by using these methods. If you are allowing delta CRL publishing to an Internet Information Services (IIS) web server, you must modify the default IIS configuration by setting allowDoubleEscaping=true of the requestFiltering element in the system.web section of the IIS configuration. For example, if you want to allow double escaping for the PKI virtual directory of the default Web site on IIS, run the following command on the IIS web server: appcmd set config "Default Web Site/pki" -section:system.webServer/security/requestFiltering -allowDoubleEscaping:true. For more information, see AD CS: Web server should allow URI containing the “+” character to enable publishing of delta CRLs. The first protocol that client computers should use for the CDP information is HTTP. The second protocol that client computers should use for the CDP information is LDAP. IDP is not in use. The interface uses the variables and check box names that are described in the previous tables. You can access the interface through the Certification Authority interface. From the contents pane, right-click the CA, click Properties, and then click Extensions. In Select extension, click CRL Distribution Point (CDP). Include in all CRLs. Specifies where to publish in the Active Directory when publishing manually. If you use Windows PowerShell to add CDP paths, existing paths remain in place. The first Windows PowerShell command in the example removes all the existing paths. For more information about using Windows PowerShell to remove CDP paths, see Remove-CACrlDistributionPoint. certutil -setreg CA\CRLPublicationURLs "65:C:\Windows\system32\CertSrv\CertEnroll\%3%8%9.crl\n6:http://www.contoso.com/pki/%3%8%9.crl\n65:file://\\App1.corp.contoso.com\pki\%3%8%9.crl\n10:ldap:///CN=%7%8,CN=%2,CN=CDP,CN=Public Key Services,CN=Services,%6%10"
In a certutil command, type all paths as one continuous string enclosed in quotes, but separate each path with \n. To publish the CRL, you can run the command certutil -crl on the CA from Windows PowerShell or a command prompt run as administrator. For more information about CRL configuration and publishing, see Configuring Certificate Revocation. Certutil -CAInfo Shows the status of the names, locale, object identifiers (OIDs), and CRLs for the CA. Certutil -getreg Displays the CA registry configuration. Certutil -ADCA Confirms the configuration of enterprise CAs. You can use the Enterprise PKI View (PKIView.msc) tool to check your AIA and CDP publication configurations. For more information, see the Enterprise PKI. You can also use the Online Responder role service to check certificate revocation. For more information about Online Responder, see Online Responder Installation, Configuration, and Troubleshooting Guide.